Alien Robots, a Net Entertainment (NetEnt) slot, is based on the science fiction theme. Packed with brilliant features, this slot offers several opportunities for players to strike it rich. To play Alien Robots, players need to first place a bet and then hit the spin option. They will get paid according to the game’s payout structure if a winning combination is displayed on the reels at the end of a spin. If no winning combination is displayed, players can place another bet and try again. Like all other NetEnt slots, Alien Robots also has an Autoplay and a Skill Stop Feature. 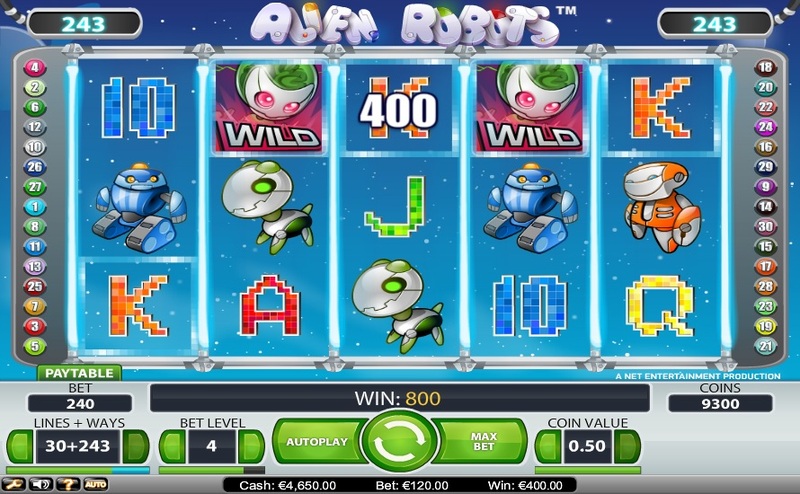 Alien Robots, a NetEnt slot with beautiful graphics and thrilling audio effects, is based on the science fiction theme. While spinning the reels, players can hear a humming sound that makes them feel as if they are travelling in a spaceship. The slot is capable of taking players into outer space, where they can interact with extra terrestrial creatures. The reels feature icons of an entire robot family—baby robot, security robot, dog robot, construction robot, and butler robot. There are also a few high-value cards scattered across the reels. Alien Robots is packed with special features such as wild symbols, scatter symbols, free spins, expanded wild symbol, and re-spins. The Alien Robot serves the function of the wild; it substitutes for other icons across the reels and helps players to complete winning combination. However, the wild cannot substitute for the scatter symbol to help players unlock the free spins bonus. The scatter is the Alien Spaceship symbol. Combinations of scatters pay even if players do not land them along an active payline. If players land at least three scatter symbols along an activated payline, the free spins bonus gets activated. The number of free spins players will get depends on the number of Alien Spaceship scatters that helped activate this feature. If players land three, four, or five scatter symbols anywhere across the reels, they will win 10, 20, or 50 free spins, respectively. Players can activate the free spins feature while playing a free spin. In fact, players can win an unlimited number of free spins during the free spins round. When the free spins are being played, expanded sticky wilds can appear whenever players land a wild symbol. These sticky wilds expand all over the reel and remain frozen in position while the rest of the reels are spun again to give players another chance to win. Once the reels are re-spun, the sticky wilds change into the usual wild symbols. Alien Robots is available for fun or real money play at any NetEnt online casino.